Not exactly a call I normally get in-line and checking-out at the grocery store. On the other end of the phone was my friend Lance Kronberger asking me if I was interested in joining him on his brown bear hunt. While that is not a hard question to answer for me, the catch was I had to be on my way in less than 12 hours. From a young age I have read about the giant Ice age throwback bears that inhabit Kodiak Island. I couldn’t say no to the opportunity to put my hands on one of these monsters (all in the name of gear testing- of course!) I was flattered by the invitation and excited to provide an extra set of eyes and some poor camp cooking. 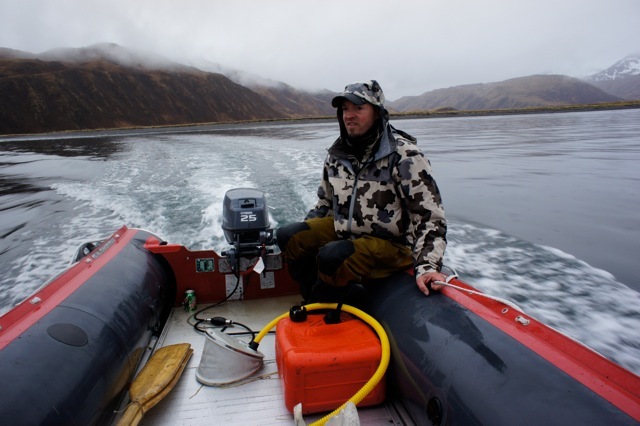 Although Lance is best known as the owner of Freelance Outdoor Adventures and Cinder river lodge, this hunt was a self-guided personal bear hunt for himself. 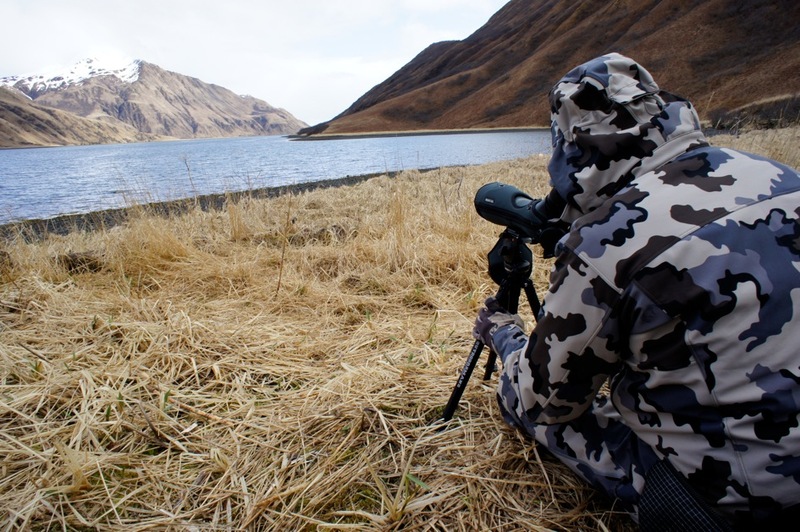 He had drawn a great Bear permit on the Aliulik Peninsula of Kodiak Island in the states lottery system. Sandwiched between guiding commitments he had worked in a rare time slot to hunt for himself. Thirty-six hours later Lance and I were setting up camp in a large coastal bay on Kodiak. 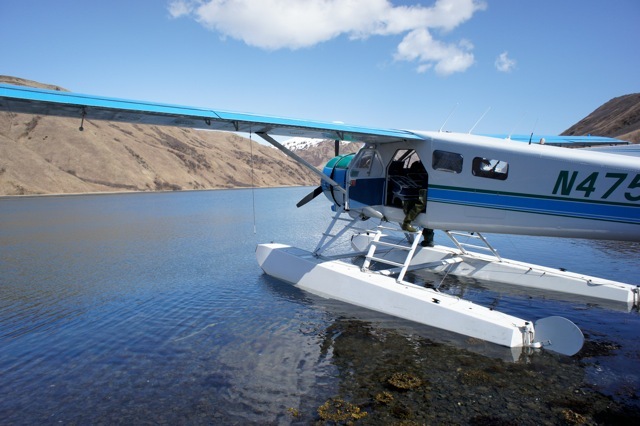 Dropped in by a Beaver on floats, we had a comfortable base camp strategically placed to allow us the closest location to three big tidal bays and two mountain passes. Lance was familiar with the area but had never hunted this specific spot. With only 8 days left to hunt in the season, he was dead set on killing a giant bear or going home empty handed. Lance has about as much Brown/ Grizzly Bear experience as any 39 year old on the planet, having been on over 70 kills, but this would be his first time as the tag holder. Not just any bear would do, we were looking for Ursus Arctos-Maximus. 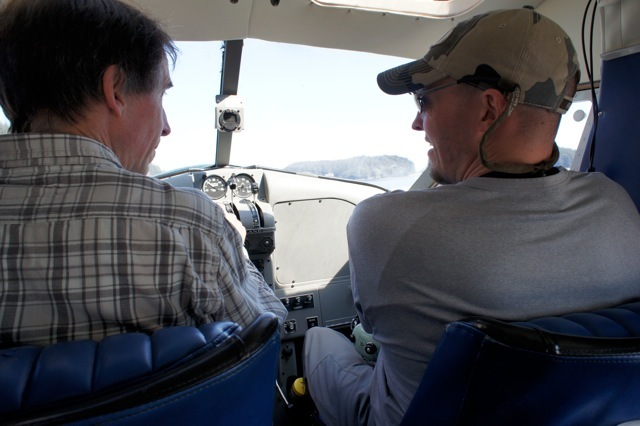 While we were loading up the plane some other bear hunters were leaving. They offered us a box of food that they had left over from their hunt. We had no weight restrictions so we took them up on their generous offer. Lance Joked “ there will be something in that box that we will NOT eat, even if we are starving.” He was right. 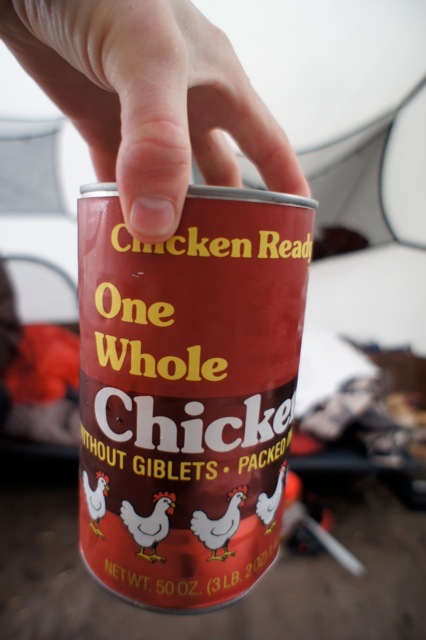 The first thing I pulled out of the box – an entire chicken (all of it) in a can! Over the next eight days Lance and I hiked, boated and glassed every piece of Brown Bear habitat we could get to. Three times we crossed the Island in search of a bear large enough to make the self-proclaimed “ big bear guy” look twice. We endured heavy rain, big temperature swings, gale force wind, and a couple of beautiful days like only Alaska can produce. Anyone who has spent time with Lance knows that he’s a busy guy, even off the clock. There is a ton going on behind the scenes that makes his business successful. 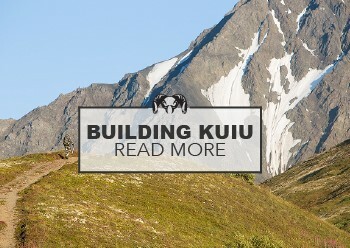 Between us hiking and glassing for bears he was trying to coordinate a building project, help his wife Nikki find the Mothers day present he had hid for her, keep tabs on his 2 young kids, and make sure he was current a number of new regulations. It is an extremely impressive feat to pull off by Satellite phone but Lance and his family are used to it, it’s simply how it is. The Brown Bear mating season was in full effect during our stay, which meant a big bear could be anywhere. 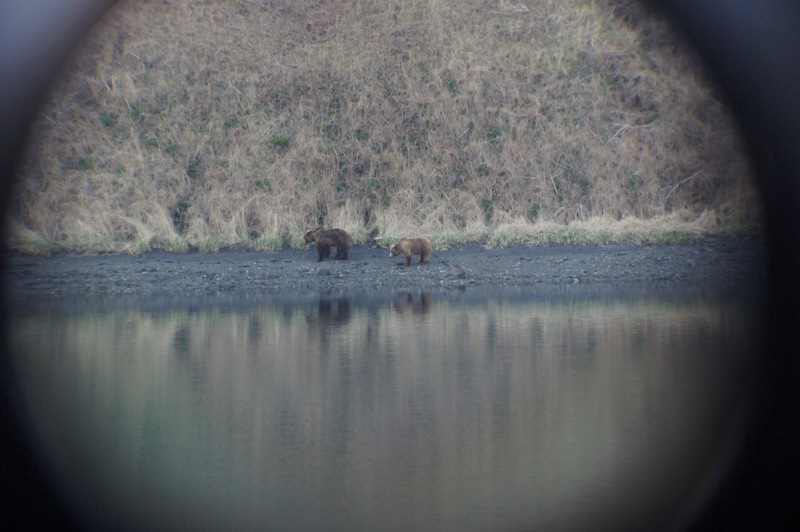 This proved to be the case as we saw bears high and low, from the tidal flats below to the snow capped peaks above. We got close to several big boars courting sows but most were not big enough to meet Lance’s high standards. One was close, but rubbed so badly it was simply not an option. 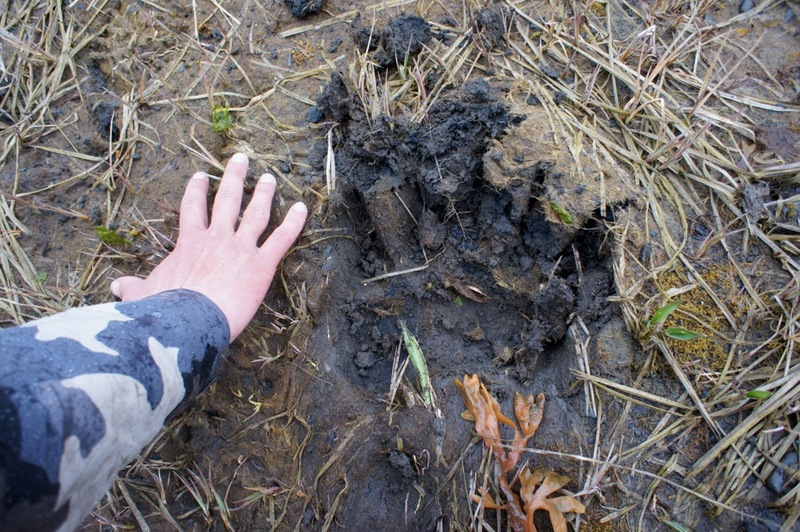 The hunting technique for finding a giant bear is basically cover as much ground as possible, both on foot and with our eyes. Most bears are not active in the morning so we stayed out late glassing until dark, which made for some long late-night hikes through bear country. 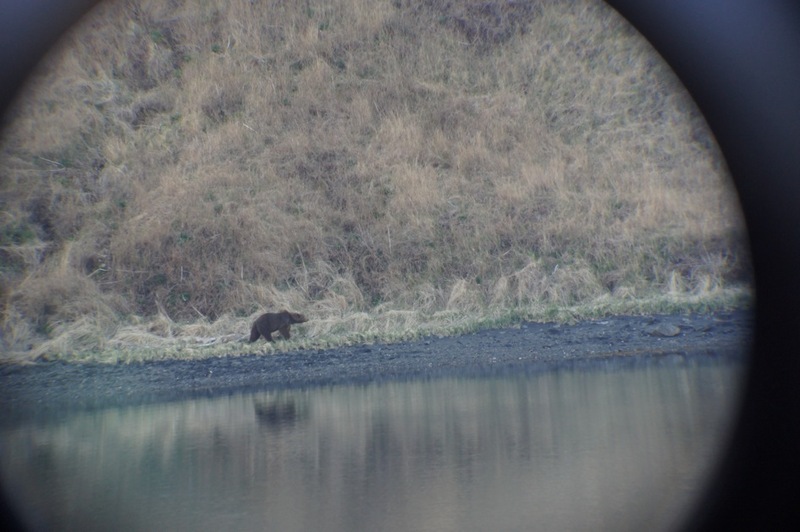 Overall we laid eyes on 39 different mature lone bears, including 6 boars that would go over 9 foot square. ( Not that I was keeping score, but the count on bears spotted between us was 29 to 10 in Lance’s favor- a good old fashion beating). We made a play on what could have been a big bear on day 5, but he simply vanished by the time we got to where we had seen him. It was a long windy 7 mile walk back to camp in the dark. No, I don’t want to go brown bear hunting. Never have been excited about shooting a bear. Bear meat ? Yuk. Way to build the suspense! Is that a mastodon tusk in the last photo?! 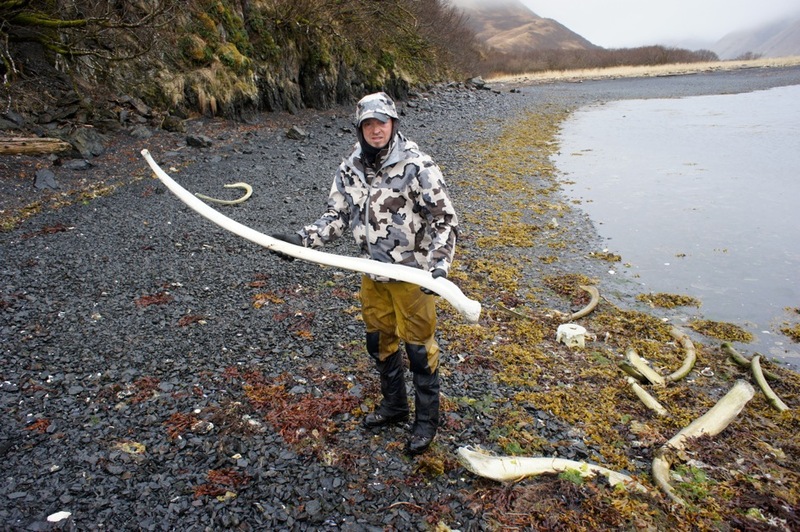 Not 100% sure, as I’ve never seen any, but my guess is those are Whale bones…. Great story guys and I learnt something too… you CAN put a whole chicken in a can… man you guys have it all… I wonder how many hunters that can has been handed down to??? 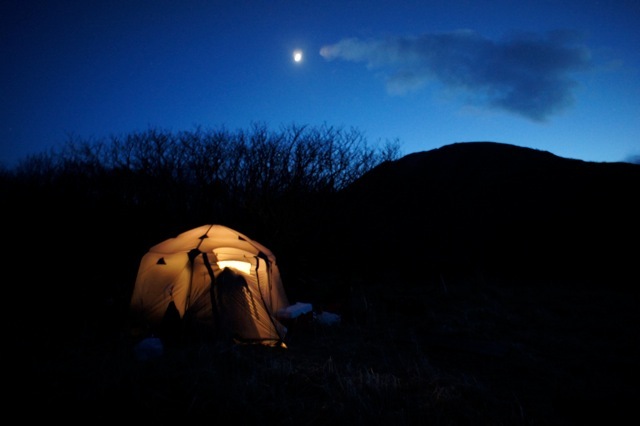 good story and some great pictures, love the one of the tent at night! I think starvation is a better option. No amount of tabasco would make that decent . Boy that is horrible. Great story! I thought the last post was the tease, now another one? I’ll be watching my RSS feed like a hawk. You are correct, Lance is holding a whale rib bone. We found an old dead carcass along the beach that was a few years old. 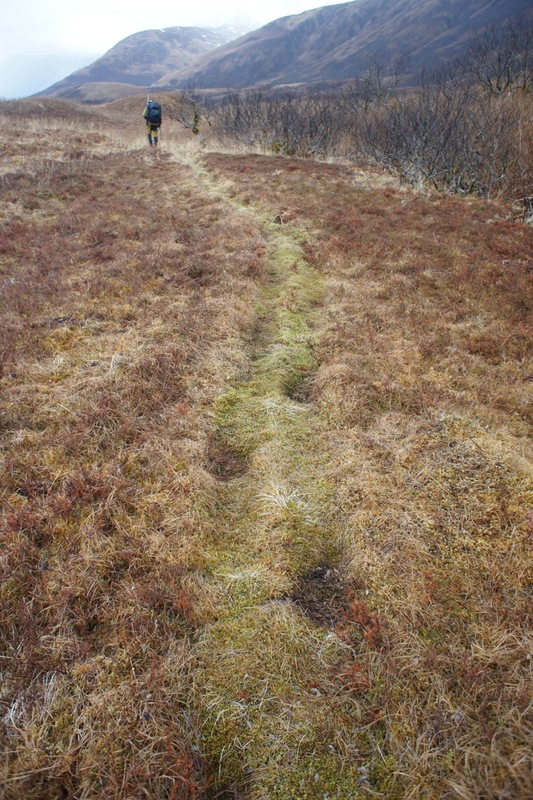 The Trail Lance is walking on in the 7th photo is an example of the bear trials that connect drainages. 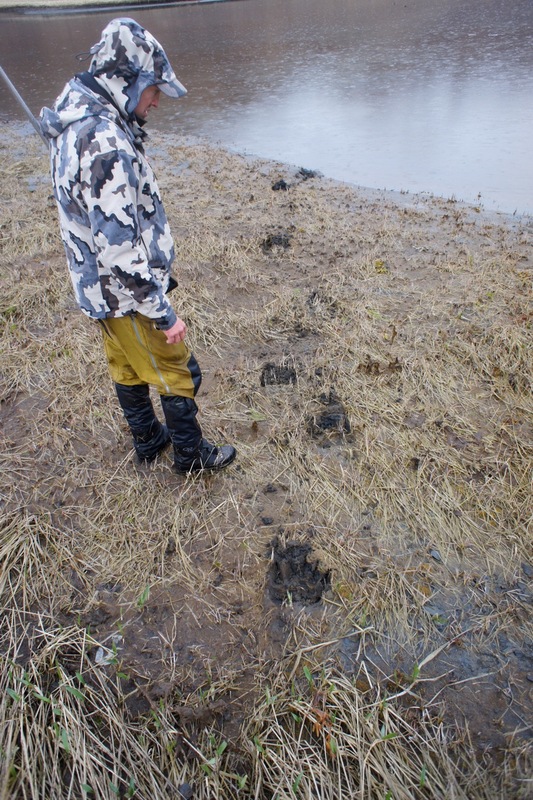 The tracks are easily distinguishable from hundreds of years of bears walking in the same footprints. I had read about them but never seen one for myself. Really cool. The whole chicken in a can was pretty funny. We got pretty low on food the last few days, but not low enough to crack into that can! If it came down to that or spam I believe I would just eat my boot! Part two is on its way. hope y’all found what you were looking for! so why is Lance covered in Kiui gear, and using a Barney’s pack? What an awesome hunt! Look forward to the rest of the story. 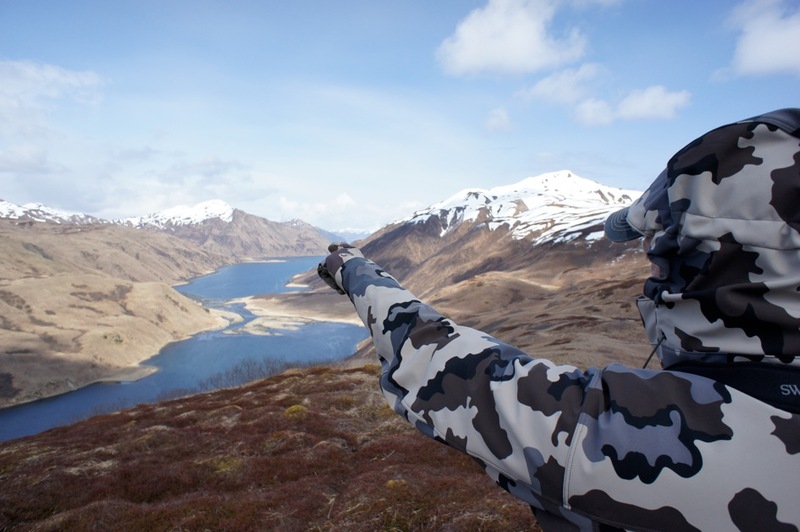 You (and we) need some Kuiu gaiters and balaclavas. Bears taste bad and don’t have hooves. Dont leave us hanging!!! lets see this beast!! !